Order food at the tap of your finger! 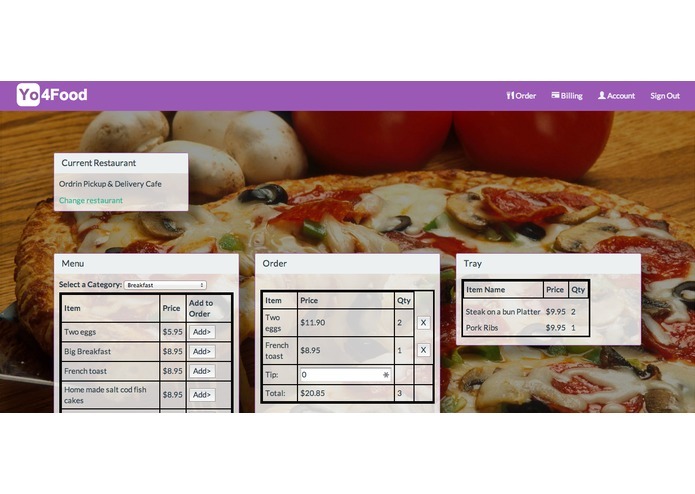 Inspired by Push for Pizza, but disappointed with the menu items and lack of Android support, we decided to build an app that could order ANYONE food at the touch of a button (after some quick configuration of potential orders to set up on the website). If you're the kind of person who always orders the same sandwich at Jimmy Johns, or gets the same pizza order after each party on Friday, then Yo4Food is 4U. We are proud of the stupid-simple yo-like usability of the platform, as well as the fact that we were able to complete this hack despite two massive outages of Ordr.in's test servers, which we were using to build the app. During these outages, we were able to create other Yo-based easter eggs within the server, including a Yo-yo (sends you a yo right back!) and a yo-mamma application (sends you a yo with a joke personalized for yo-mamma! ).